Now we see the ripple effects of President Trump demanding American taxpayers pay, via our own government budget, for the wall that he himself said some 20+ times would be paid for by Mexico (http://fortune.com/2018/12/13/trump-mexico-border-wall/). Those 800,000 federal workers on furlough or working without pay were not enough to have our President “get off the wall” (sorry, had to use the pun). Now we see the profits of big corporations negatively impacted by the government shutdown. Perhaps that will be enough. $1,000 is pretty steep for a phone, especially when the advantages over my iPhone 7S seem minimal. On one hand, Apple makes great products that last a long time. On the other hand, great long-lasting products don’t get replaced often. This is where Microsoft’s focus on enterprise, cloud services, and subscriptions is paying off in the form of continued revenue growth. Apple has been consumer-first rather than enterprise-first from the beginning. Unfortunately, they are running out of consumers for $1,000 iPhones. Yes, services like Apple Music are an attempt to generate service-based revenue. I just don’t see the same growth potential in individual music subscriptions as in enterprise software and cloud services. To Student Investment Fund Microsoft fans of the past (Peter, David): I humbly apologize for disregarding Microsoft as “not competitive with Apple” and “doesn’t add to diversification.” I was wrong. In retrospect, Microsoft with business customers and Apple on the consumer side would have been a good combo meal. The company has reached the end of its denial phase. China could be the new “weather” for sales shortfalls. The optimistic narrative about Apple Inc.’s iPhone business is falling apart in front of our eyes. The company on Wednesday stunningly slashed its own revenue forecast for its first fiscal quarter that ended in December. 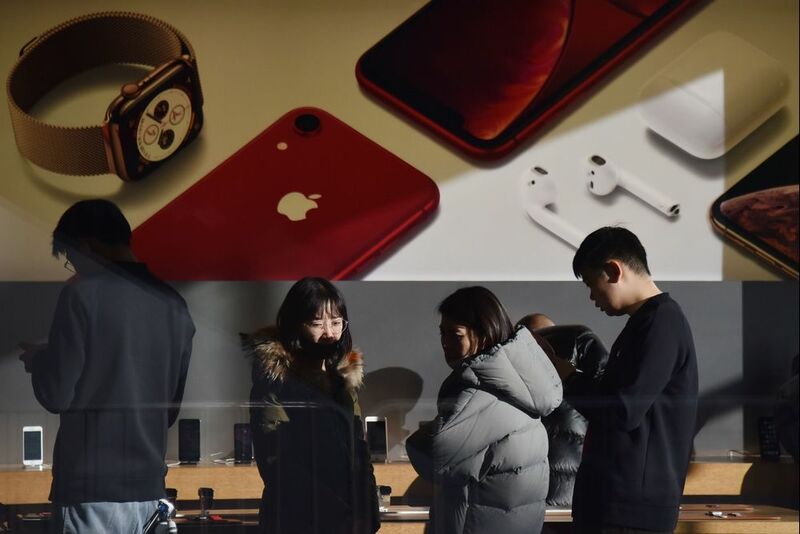 Apple led by blaming a slowing economy in China and the trade skirmish with the U.S. for worse-than-expected consumer transactions in the region that includes China, Taiwan and Hong Kong. Apple said its first quarter revenue is now expected to fall about 5 percent from a year earlier. China may be the new “weather” — a go-to excuse for companies whose sales aren’t up to snuff. But that wasn’t all. In an extraordinary letter to Apple investors, CEO Tim Cook also told stockholders what he should have been saying for years: The company’s iPhone business has shifted into a lower gear because of changes in the smartphone market and consumer behavior. This should have been absolutely predictable to anyone who was able to peer outside of Apple’s bubble. Executives have failed in their duty to warn investors ahead of time about all this, and reality is finally and all at once catching up to Apple. In his letter, Cook said in some established markets outside of China, iPhone “upgrades also were not as strong as we thought they would be.” (Upgrades are people with older-model iPhones opting to buy new models.) The company attributed that to economic weakness in some countries but also other factors, including people holding onto smartphones longer as mobile phone companies halt subsidies, the climbing prices of Apple’s devices, and users taking advantage of lower-cost battery swaps rather than purchasing the latest and greatest iPhones. In addition, Cook wrote on Wednesday that economic conditions slowed in China in the second half of 2018 and that shopping traffic was hurt by uncertainty about the U.S.-China trade war. Here, too, Apple missed opportunities to caution investors. Cook said two months ago that Apple’s China business was “very strong,” even amid signs of an economic slowdown and months of headlines about trade tensions with the U.S. He consistently told investors that he thought the U.S. and China would resolve their trade dispute amicably and didn’t give any indications that consumers were on edge or reluctant to shop because of the geopolitical fracas. It’s possible that the last couple of months of economic circumstances in China, Taiwan and Hong Kong caught Apple by surprise, but executives failed to give any hints of red flags in the region. It’s possible conditions in China changed quickly, but the broader trends in smartphone activity are not new. Why didn’t Cook make any of these admissions before now? Phone companies in the U.S. and some other big smartphone markets have for years sought to stop offering people iPhones at an artificially low price of $200 as they did in the iPhone’s earlier days. That factor — plus less drastic changes to each year’s model of iPhone or other smartphones and the rising prices of some new devices — has led people in the U.S. to keep their smartphones for more than three years on average, up from about two years in 2014, according to mobile industry consultant Chetan Sharma. Apple sells by far the majority of new iPhones to people who already owned one of the devices, which means sales are dinged if someone wraps electric tape around her three-year-old iPhone and soldiers on. This is a trend years in the making. But at each and every opportunity, Cook has dismissed questions about whether changes in upgrade behavior will hurt Apple’s revenue. In an August conference call with stock analysts, one of them asked Cook whether the company could continue to sell more iPhones in a few years in light of the smartphone market’s stagnation. Cook said he thought Apple could sell more phones to people who already owned iPhones, to those who had competing devices and to people who had never owned a smartphone. It was an answer straight out of 2015, when everything Cook said was true. It’s not true anymore, and Cook should have known that. The research firm IDC estimates global sales of smartphones declined slightly in 2018, as they did in 2017. Apple seemed to defy that smartphone gravity for a long time, but it didn’t. In Apple’s fiscal year ending in September, Apple barely sold more iPhones than it did the previous year. Revenue increased because Apple charged a super-premium price for the iPhone X and other new models — and Apple loyalists paid those higher prices. But there is a limit to how many people are willing to pay $1,000 out of pocket for a new phone, and it seems as if Apple reached that limit all at once. This isn’t to say that Apple’s business is falling apart. It is still generating levels of revenue and cash flow that are the envy of the corporate world. But Apple failed in the No. 1 mission of being a public company: being honest with investors about its business. The company simply denied the reality that was staring it in the face, until denial was no longer an option. I thought that is what farmers do: sell crops to generate cash flow. Now, the problem may be that export prices for U.S. agricultural products destined for China are forced lower due to the trade war. Q1: Why can’t these farmers sell their products elsewhere? A1: Possible answer: We can’t assume that demand generated from China’s population of 1.386 billion people can be easily found elsewhere on the planet in short order. Q2: Why don’t farmers switch to different crops and sell to other countries demanding these different crops? A2: Possible answer: I am not a farmer. I can’t even keep a house plant alive. Believe me, I have tried over and over again. So the following is conjecture. Switching crops takes time and money. Couple that with the possibility that unmet demand for these “other” crops may not exist. That is, there may not be significant demand for these other crops to justify the switching cost. Q3: Did our trade-war mongering administration, including those that voted for this administration, consider the economic ramifications of this trade war on China? A3: I don’t know. Judging by the hastily put together farm payout, which some consider a bribe for more votes, it sure doesn’t seem like it. Q4: Japan sure makes nice cars. Are we going to come up with a reason to initiate a trade war with Japan because they continue to sell sedans here in the U.S. while companies like Ford stop producing due to unprofitably? A4: That seems tough to me. We can’t say Japan’s government gives Toyota, Nissan, Honda, and Mazda (we can even reach over to South Korea with Hyundai and Kia or Germany with Mercedes and BMW, or any other country for that matter) an unfair advantage by allowing them to destroy the environment and underpay labor. But who knows, we humans suffer from self-attribution: when we do well it is due to our greatness, when we don’t do well we blame someone else. Ford’s inability to produce sedans profitably relative to the Japanese couldn’t be due to Japanese corporations adopting the quality control teachings of American W. Edwards Deming faster than American companies (https://en.m.wikipedia.org/wiki/W._Edwards_Deming). Update: a bit ironic that the Trump shutdown is due to funding demands for an infeasible and ineffective wall for “border security.” It seems that if a mythical effective wall were constructed and the border is “secured,” which is code for “ban Mexicans and other Latin Americans,” that farmers would have difficulty finding low cost labor to carry out any switching plan. Maybe the funding should be used to help non-criminals attain legal working status here (read: help American farmers) and to help law enforcement weed out criminals. BTW, “criminal” is nationality agnostic. Or maybe invest those funds in education or something here instead . This article provides interesting perspectives on trade wars, GDP, world reserve currency, the trans pacific partnership Obama started and Trump ended, manufacturing, and more. Definitely worth the read in my opinion. Why does this come to mind? Yacktman Asset Management at the time managed $13.7 billion with 9 people. Jabre mentioned in this Bloomberg article, in contrast, managed $1.2 billion with 40+ employees in April 2018. We were (are) fortunate to hear from some of the best in the business. The second thing that came to mind is what Mattie Von Turk, retired finance professor from U.C. Berkeley, told me during Berkeley’s CDAR Symposium: market efficiency is not an absolute truth, rather, it is a benchmark to judge asset manager performance. As such, “beating the market” on a risk adjusted basis net of fees is hard work. In the Bloomberg article below we see a growing list of experts in the field exiting the hedge fund business due to difficulties in achieving superior risk-adjusted returns net of fees.